I have been on the search for a gluten-free pie crust for quite a while, but low and behold I will look no further as I have found a pie crust recipe from Jules Shepard that is astounding and this recipe has been adapted from Jules Shepard and her awesome flour, thank you Jules! Every year my family and I pick all sorts of different kinds of berries, we love berries. I make jam, pies, syrups, smoothies and many other delicious treats with our berries. A family favorite is pie and this Gluten-free Blueberry Strawberry pie is absolutely delicious. This pie has a sweet and sour filling paired with a flaky crust leaving me wanting more and more and they are mini pies so you can have more than one, right?? In a medium sized metal bowl add 2 cups all purpose gluten-free flour (Jules), 2/3 cup earth balance shortening sticks, 1 teaspoon salt, using a pastry cutter or two knives cut mixture until it resembles a course meal, slowly add 1 Tablespoon of water at a time careful not to add to much or dough will become sticky, when dough comes together form two separate dough balls and wrap individually in plastic wrap. Cut 9 strips eight inches a piece of parchment paper and place into the bottom of your muffin pan. Rachelle, those are beautiful!! I love the mini-pie concept. And yes, of course I firmly agree that you can eat more than one because they are mini! Could you use this recipe as a regular pie? .....and what is the recipe for the crust? I mean...the GF all-purpose flour? These look so good, and I'm thrilled I can make it dairy free too! 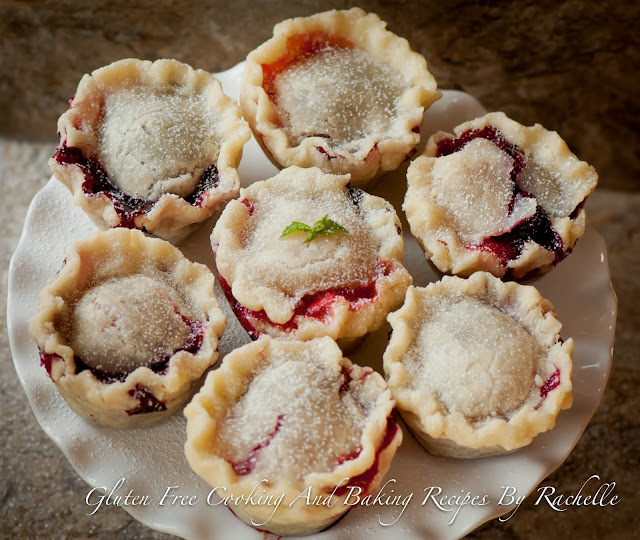 Suzanne, I'm GF and DF so I was excited to make these litle pies, they are soooo good! Sorry, but how do you get sides on the mini pies? Do you fold the 5 in circles up? Thanks, love these and can't wait to try them! I made this yesterday. Once I rolled out the dough I realized there was no way I would be able to cut out even close to nine 5 inch circles, let alone those as well as nine more 3.5 inch circles, so I opted for the full pie. Am I being dense? Did I read the instructions incorrectly? ?